Do you ever find yourself attracted to a recipe just because it’s humorous or maybe it sounds a little dangerous? I confess that’s what first drew me to a recipe for Inner Beauty Hot Sauce. I’ve always loved chillies but it was not until I was at university that I discovered a love and obsession for the Habanero. It is still my favourite chilli pepper. It’s one of the hottest chillies but it also has a wonderful fruity sweetness that makes it really versatile. While writing my thesis, I spent more time than I should trawling recipe newsgroups on the web for Habanero recipes, leading me to what has become my absolute favourite hot sauce. Apparently, its origins are Jamaican and the recipe I found was originally sourced from Big Flavors of the Hot Sun by Chris Schlesinger. Every post I’ve seen since appears to transcribe the same blurb that comes from the book. I’ve been making this hot sauce ever since. The first time, I made it according to the recipe. It was OK, but not that great (no disrespect intended to Mr. Schlesinger!). Over the years I experimented and the recipe I use now is still true to the spirit of the original but I’ve adapted it considerably and I think the flavour now is spectacular. Most importantly, good quality ingredients will make this sauce sing. Just because it is seriously hot doesn’t mean you cannot appreciate the flavours that the other ingredients bring to the sauce. My version is also a little hotter than the original. So the warning stands! I’ve grown Habanero, red savina, cayenne and bhut jolokia (Dorset naga) for years. Unfortunately, the weather this year hasn’t been conducive to the fruiting of my chillies. It’s been too wet and too cool for everything bar the cayenne. Only now, as autumn takes hold, are the bhut jolokias starting to produce fruit. The Habanero is just sitting there wishing it were in Mexico. Enter my mum’s hairdresser, the lovely Angela. She has a large and productive rocoto chilli plant, although she had no idea what it was until she gave me a few chillies last year. The rocoto chilli is native to Peru and is the only chilli pepper to have black seeds. It grows very well in cooler climates. Angela has an abundance of rocotos this year and I’ve reaped the bounty of the harvest and her generosity. She has a big heart … and a family with a low tolerance for hot chillies 😀 And yes, I got seedlings for my garden. We are now in cahoots! Rocotos are fairly close to habaneros on the Scoville heat scale (they both sit in the 100,000 – 350,000 range). By comparison, the naga jolokia sits in the 855,000–1,359,000 range. Whooaa. Guess who’s stupid enough to have whizzed some in a food processor and eaten a teaspoonful or two only to find herself lying on the floor unable to breathe? Oh, are those fingers pointing at me?? Right. I did that twice. You know, just to be sure. Don’t mess with hot chillies. Anyway, this year I decided to make a Peruvian style Inner Beauty Hot Sauce and use those lovely perfect rocotos. The Inner Beauty Hot Sauce is sweet, spicy and hot. A total party in your mouth. At this point you’d be wondering … she’s got chillies and mangoes. Uh-oh. Where’s the chocolate? Well, funny you should ask. I added a little grated 100% cacao chocolate to half the sauce – Willies Cacao Peruvian Black San Martin in keeping with the Peruvian theme. It adds a depth of flavour that’s fantastic with the fruit and spices. Chocolate. Chilli. Mango. In a hot sauce. Seriously. Win! 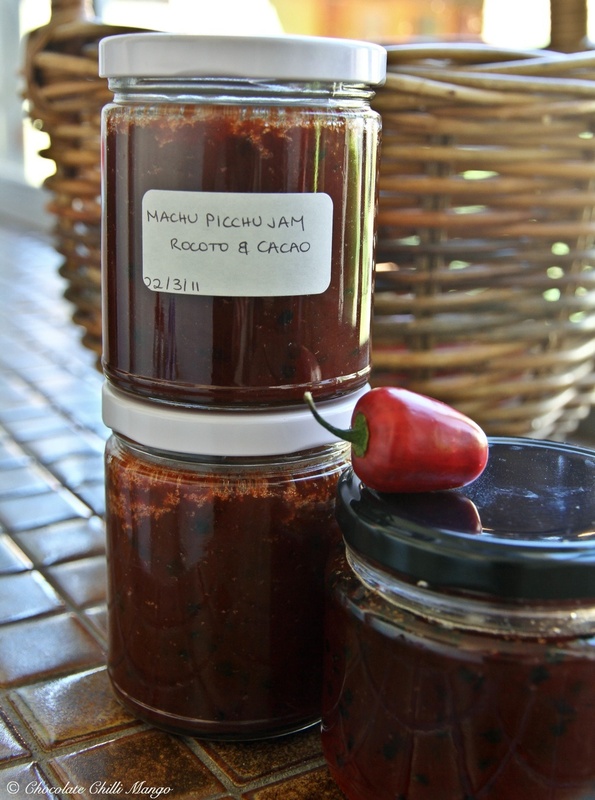 I got some more chillies delivered a few days ago so I made some rocoto chilli jam as well. It’s got a beautiful ruby colour and a delicate balance of sweetness and heat. This jam is very simple. No onions, tomatoes, capsicum, or spices. Just chilli pepper, sugar and a little lemon juice. I like the purity of it and its simplicity makes it much more versatile. 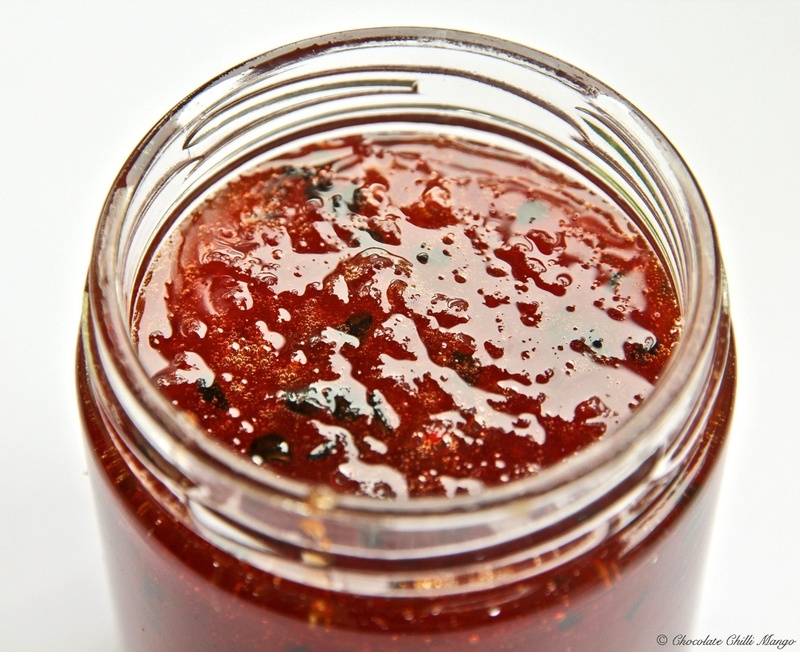 Both the sauce and jam make a zingy accompaniment for chicken or fish dishes. The jam is also fabulous with cheese. 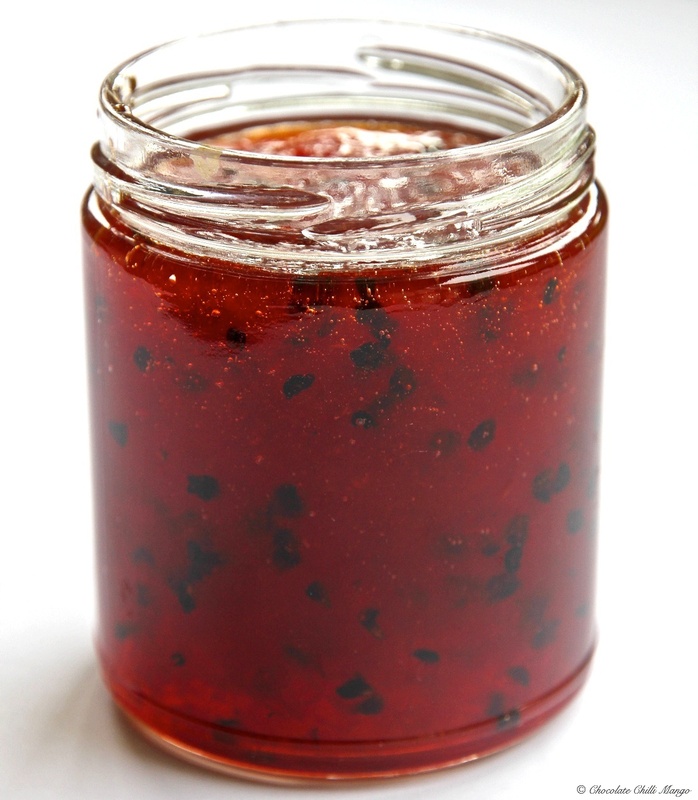 You could even use the jam sparingly in sweet dishes to add a little zing. No, I didn’t use any chocolate in the jam this time. It is a fabulous idea though, isn’t it? Best advice for handling hot chillies is to wear gloves. Do not rub your eyes or face! Take care, especially if you are not used to handling chillies or this is your first time cooking with them. Adapted and hotly vandalised from the original recipe in Big Flavors of the Hot Sun by Chris Schlesinger. But thank you Chris. (Pun intended). 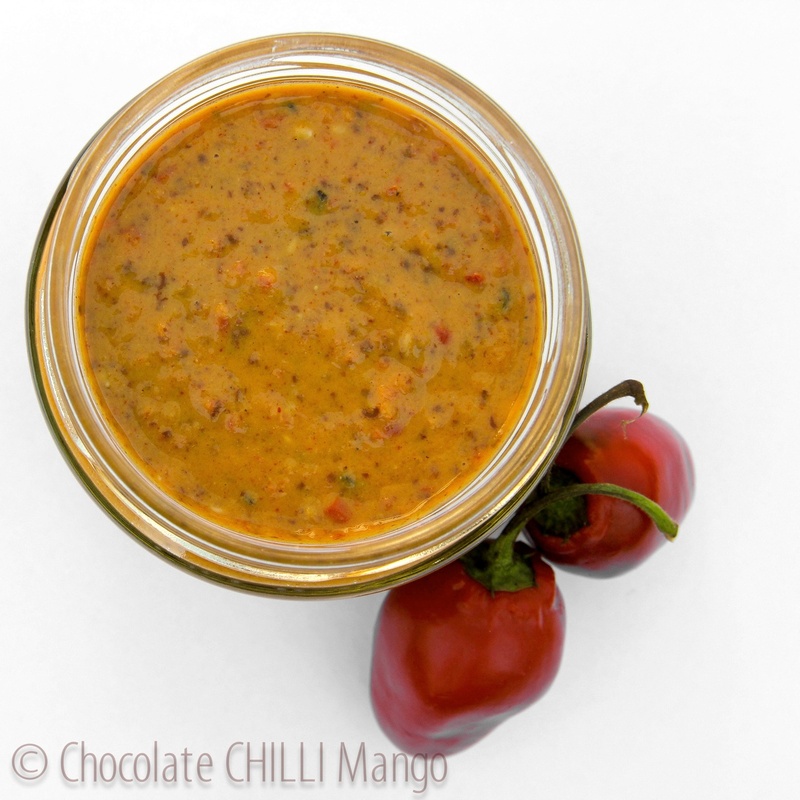 Feel free to use other chillies to make this sauce if you prefer less heat. 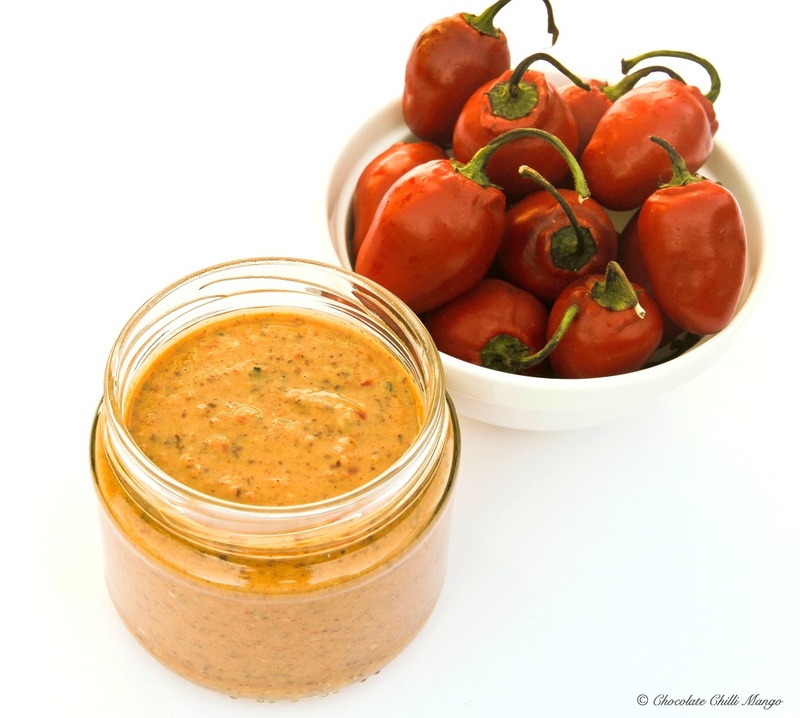 Alternatively, use the Habanero or rocoto (or a mixture) but use less of them. The sauce will still be wonderful. Whizz the chillies in a food processor until finely minced. Add the mango flesh and all the other ingredients and pulse until well mixed and smooth. Be careful not to stand too close. The fumes will make your eyes water. Pour the sauce into clean glass jars or bottles and seal. This sauce will keep in the refrigerator for several years. There is no need to process the sauce in a water bath. Bacteria wouldn’t be game to go near it. It’s probably corrosive. I’m kidding. But do keep it refrigerated and it will last. Not adapted from anywhere. Just me doing my own thing with the jam making. I left the seeds in there as I think they look very pretty flecked through the jam. You can remove the seeds if you prefer. It doesn’t change the heat profile, it’s simply an aesthetic preference. I used a non-stick heavy based saucepan to make the jam as I find it helps prevent burning. If the jam starts to burn, it’s pretty much ruined. Be careful to keep the kitchen area well aired while making the jam. The fumes from the chillies can be fairly potent while it’s on the stove. 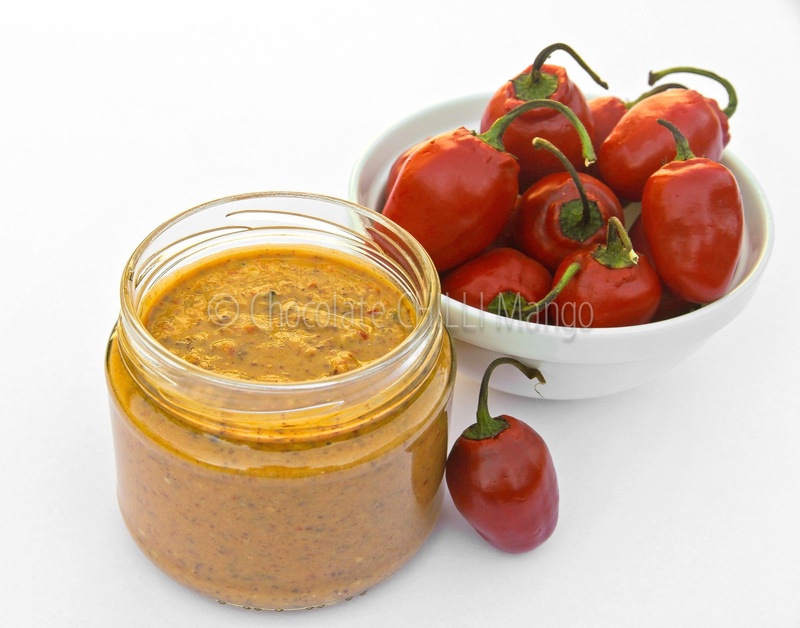 If you make this with habaneros, you most definitely need to keep windows and doors open. Whizz the chillies in a food processor until finely minced. If you prefer, de-seed the chillies before processing. Place the chillies into a large saucepan and add the sugar. Juice the lemons and add the juice to the other ingredients. Mix well with a wooden spoon. The jam will keep, stored in a cool dry place, for a long time. I’ve kept it for several years this way when I’ve had a glut of chillies and made more than we could use in a year. I mentioned adding the 100% cacao Peruvian Black to the jam, right? Well, I got another bag of rocotos to play with so I made the jam and added 20 grams of the chocolate, grated. I added it right at the end, after I took the jam off the heat. Simply stirred it in and hey presto!